Posted: Wednesday 22nd July 2015 in Uncategorised. My name is Lois, I recently completed my first year at Newcastle University where I am studying Media, Communication and Cultural Studies. I wanted to gain experience within the media industry and use my time over summer wisely, so I applied for an internship with Summit. Feeling very welcomed by everyone on arriving at Summit on Monday 6th July for my first day as an Online Marketing Executive, I was not full of those ‘new job’ nerves at all. After meeting the other new starters and the Summit teams for breakfast, we got the important stuff out of the way and went through policies and procedures and signed our contracts. We then filled out our ‘Personal Profiles’ and found out each other’s interests, secret skills and guilty pleasures – one way to certainly break the ice! HR Assistant, Annabelle, then took us on a tour of the unique office buildings and pointed out the lovely views. 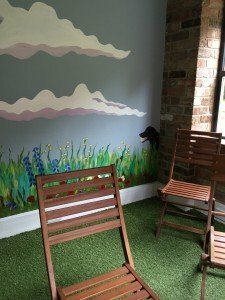 We were shown around all of the themed meeting rooms such as The Garden Room, The Boot Room and The Tree House, which is my personal favourite. We then took a tour of the work spaces and met everyone individually, learning what their roles are within the company – I’m getting there with names! The new starters were then allocated within different teams and I had the chance to meet my mentor, Laura – who has been very kind and helpful. I am currently assisting the SEO team which involves online PR and client management which is brilliant experience for me. After setting up my computer and emails, I was given an on-going task from my line manager, which puts my research skills to the test. Using in-house tools, I created a spreadsheet of the PPC and SEO visibility of the top 50 retailers over the last 6 months, I also researched their PPC, SEO and eCommerce providers – not only developing my knowledge of Excel, but also learning that it is very important to track the performance of the competition as well as the clients. Later that morning, the other new starters and I attended a speech given by Summit’s co-founder and CEO, Hedley Aylott. This offered great insight into how the company began, how the company works and the guiding principles and ambitions. Hedley explained that passion, honesty, kindness, teamwork and learning are all very important and unlike any other company, he was still learning and on his journey too, which makes the sense of teamwork and friendliness clear within this business. 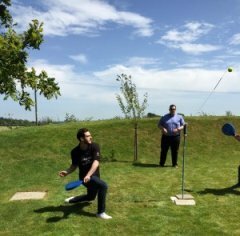 Lunch was a lot of fun – with the staff ‘Wimbledon’ swing ball tournament in full swing – literally! This tournament is just one of the many ‘Summit Olympics’ summer sporting activities. The company is divided into three houses, The Sharks, The Vipers and The Lions, all of whom are competing to win points; let’s just say this all gets taken very seriously. Overall my first day was filled with fun, learning and activity, and I’m looking forward to getting to know Summit and my new colleagues over the next few days. 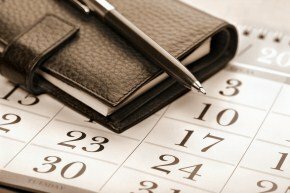 Watch this space to read Lois’s future diary entries as she settles in with Summit. Why not check out Lois’s piece about her first week. If you are interested in working with us you can view all of our current vacancies in the careers section of our site.